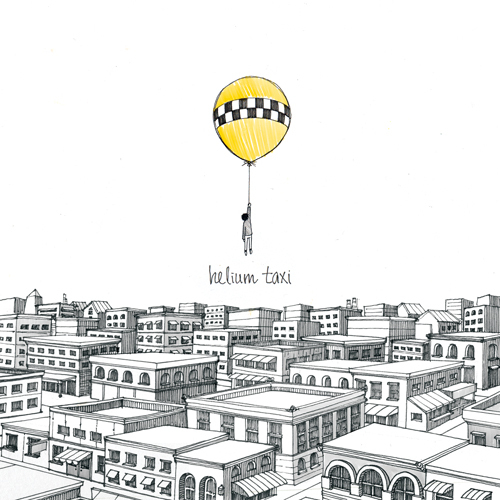 I am really thrilled to announce that Helium Taxi, my first-ever album of original music, is available to buy today. The album is a collection of eight instrumental tunes, in the newgrass / jazzgrass / progressive-acoustic / whatever-you-want-to-call-it genre(s). It was all recorded live, no overdubs, on Cinco de Mayo 2012, with a string-band lineup including some of my absolute favorite players in Austin, or anywhere, really: Noah Jeffries on mandolin (who also co-produced), Dennis Ludiker on fiddle, Matt Mefford on bass, and Trevor Smith on banjo (I’m on guitar for this record). Those first three guys are in MilkDrive, and Trevor’s main gig is with Wood & Wire. The cover art is by Joonkyung Shin, a buddy I worked with at frog design, where she was generally revered by her colleagues for her versatile but always-compelling illustration style. The album title is just a little phrase I loved in the last verse of the perfect-little-gem-of-a-pop-song title track from The Weepies‘ debut album Happiness. I have been writing music ever since I started playing guitar (obsessively) back in high school, but have never really had much of an outlet to play the material I’ve stockpiled over the years. It only took 10 years of hanging around Austin to take notice of the players who could really bring out the potential I saw in these tunes, and realize that they could be rounded up to work on such a project as long as we could figure it out among their busy schedules. There are many more tunes where these came from, so I really hope you’ll buy a copy and tell 1,000 of your closest friends to do the same so I can do this all over again as soon as possible. Over at my Bandcamp site, you can stream all eight tracks from the comfort of your browser, purchase the 8-track digital download for only $6 (or more; it’s pay-what-you-wish), or pre-order a CD (includes instant digital download) for $12 (or more, did I mention that yet?). Oh, and if you’d like to keep up on announcements specific to my original music activities, please head on over to the new roblifford.com and sign up for the mailing list. There’s a really interesting discussion going on, sparked by Amanda Palmer’s smashing of a significant milestone on Kickstarter in May. I was drawn in by Austin Kleon’s response to a New York Times article about the whole thing. Go read that in another tab. I’ll wait. Then Scholl responded, via Tumblr, with a clarification: he was trying to say, in part, that the ability to fund your project (or even to sell your project to a record label) might affect what music gets made and heard. So, it sounds like he’s somewhat concerned that the world will miss out on some great artists if we establish a pattern where only the ones who are good at online engagement can actually get their work released. To which I’ve just got to respond: that is a great point, Greg, but if it matters now, it shouldn’t matter for long. Many artists are already starting to unlock the potential of Kickstarter (and similar tools) in a huge way, but the fans have barely caught on yet. Someday, and I don’t think the day will be too far off at all, an unknown artist — someone who’s an electrifying performer, but fairly inept (or even just inexperienced) with net-based self-promotion — will pull in an eyebrow-raising amount to make a debut album. And it’ll happen via a Kickstarter project initiated and run completely by fans, on the strength of fan-produced audience videos, and little else. It’s going to be really fun to watch. It’s going to be even more fun to participate. If the core issue was just legal equality, then why not avoid the polarized marriage issue and fight for equal rights with civil unions? I don’t think the core issue for the anti prop8 group is equal rights, it’s wanting social acceptance of their lifestyle. And so, slowly but surely, we will. Over the next decade or two, through court rulings, legislation, and probably eventually a constitutional amendment, American society will force people to accept a broader definition of “marriage.” What we can’t do is force people to approve. And that’s perfectly OK. I fully support anyone’s freedom to disapprove all he or she wants. But as many on Twitter immediately pointed out, we’ve already lived through the lesson that “separate but equal” is not really equal, and so as a society we are obligated to take the next step in defining what marriage is. I’m pleased and proud that we’re going to do this during my and my kids’ lifetimes. About two and a half years ago I played a gig at the downtown Austin farmers’ market where I got to play guitar and focus entirely on my own material, something I hadn’t done in many years. 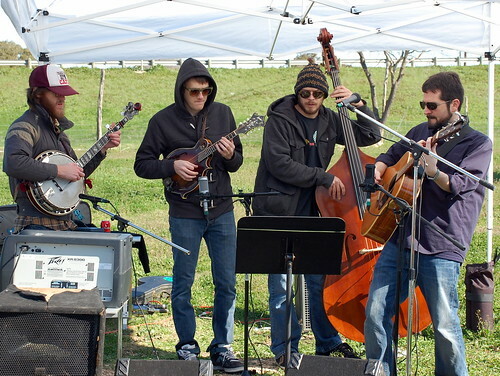 In January I had another opportunity to do it again, so I rounded up three great musicians to play with: Dennis Ludiker and Matt Mefford from MilkDrive and Trevor Smith from Green Mountain Grass, The Bluegrass Outfit, and various other Austin acts. This time I was also lucky to have my buddy Justin Burke doing the audio engineering and so we got some of it recorded: here’s most of set 2. There’s some second set video footage as well; I’ll put that on YouTube after I have a chance to update it with the wind-free audio that Justin captured. Looking forward to doing one of these again if I can find the opportunity to do that when the MilkDrive guys aren’t on the road. Cheris took her camera & tripod into Graham’s room a few weeks back and got some great shots of the kiddo as his favorite stuffed bear cycled through its light routine. Since animated GIFs seem to be back in fashion these days, I thought I’d make a couple. Just posted another new song over at https://rob.lifford.org/ysay/. As I mentioned on Twitter when releasing this, someday I suppose I’ll record “serious” music again, but until then, you’ll get weird stuff like this. Turning off comments for this post; if you have ’em, please leave ’em on the song page.